Steve Reich, Pound Ridge, New York, September 13, 2015. Photo/Portrait: Bonnie Sheckter. 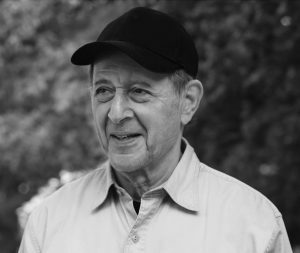 On October 3, 2016, Steve Reich celebrated his 80th birthday. This festive occasion was the catalyst for a year-long tribute to the man who has been acclaimed as “our greatest living composer” (New York Times) and “the most original musical thinker of our times” (The New Yorker). A quick glance at the concert section of the Steve Reich website shows that his compositions are being performed almost every day of the year somewhere in the world. Many of these concerts this year, especially the ones with Reich in attendance, have turned into rousing birthday parties with premieres of brand new compositions from the composer who is now officially an octogenarian. Reich’s actual birthday was on Rosh Hashanah, and he spent the day in observance of the holiday. 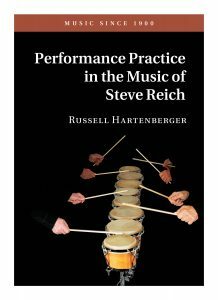 As my way of honoring him on that day, I announced the publication by Cambridge University Press of my book Performance Practice in the Music of Steve Reich for which Reich wrote the foreward. Steve Reich’s loft at 423 Broadway, NYC, September 23, 2016. Photo: Bonnie Sheckter. 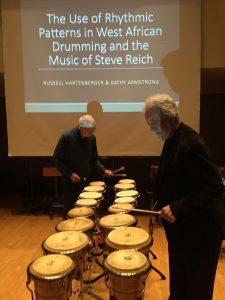 In the book, I describe my experiences as a member of the Steve Reich and Musicians ensemble beginning with the early rehearsals of Drumming at Reich’s loft at 423 Broadway in the Soho section of New York City beginning in the spring of 1971. I traced my steps to his former loft this past September and found the building in a state of disrepair – obviously not yet designated as a national historic site. 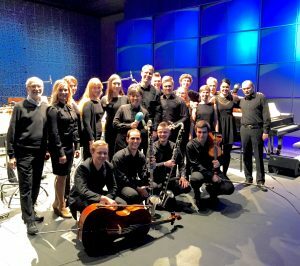 Musicians from the Sibelius Academy after a performance of Music for 18 Musicians, Feb. 3, 2016. Photo courtesy of Antti Ohenoja. 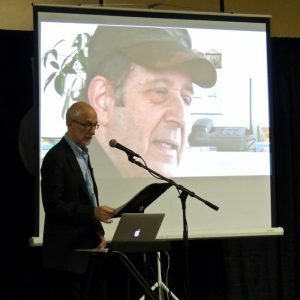 The beginning of the year-long Steve Reich birthday celebration began for me on February 3, 2016, exactly eight months before Reich’s actual birthday when I coached a performance of Music for 18 Musicians at the Sibelius Academy in Helsinki, Finland as part of Sibafest. Music for 18 Musicians at Temple University, Philadelphia, PA, April 5, 2016. Photo courtesy of Phillip O’Banion. 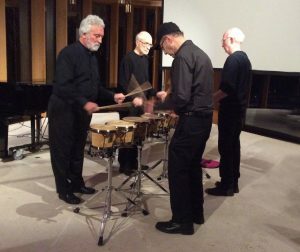 Nexus members Garry Kvistad, Russell Hartenberger, and Bob Becker performing Drumming, Part I with Steve Reich at Integral House in Toronto, April 11, 2016. Photo courtesy of Soundstreams Canada. 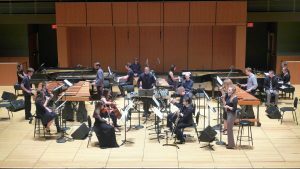 Steve Reich came to my home town of Toronto later in April for performances of Drumming, Part I at Integral House and Clapping Music, Tehillim, and Music for 18 Musicians at the venerable Massey Hall as part of a Soundstreams Canada birthday celebration in Toronto. Garry Kvistad and Russell Hartenberger performing Mallet Phase at BRIC Ballroom in Brooklyn, NY, May 17, 2016. Photo: Marc Akiyama. In May, members of Nexus, Sō Percussion, and Palladium Percussion performed Mallet Quartet, Mallet Phase, and Music for Mallet Instruments, Voices, and Organ at the BRIC House Ballroom in Brooklyn at a concert organized by Sō to honor Steve Reich in his 80th birthday year. Mallet Phase is Garry Kvistad’s new arrangement of Piano Phase played on instruments he created and tuned in just intonation. 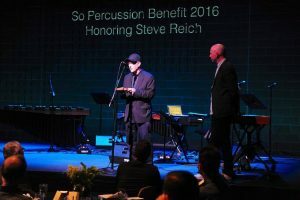 Steve Reich accepting the pulse ‘piece of wood’ from Jason Treuting at Sō Percussion Benefit Concert, May 17, 2016. Photo: Marc Akiyama. During the festivities, Jason Treuting presented Steve with the ‘piece of wood’ that Sō used for many years to play the pulse part in Music for Pieces of Wood. Nexus and Maria Finkelmeier, performing Music for Pieces of Wood at the Shalin Liu Performance Center, Rockport, MA, June 4, 2016. Photo: Diane Kvistad. 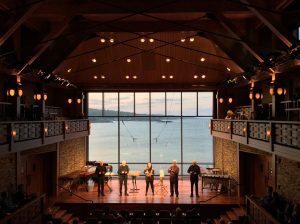 In June, Nexus played a concert at the Rockport Chamber Festival in Rockport, Massachusetts in June featuring Music for Pieces of Wood (where we were joined by newlywed Maria Finkelmeier), Drumming, Part I, and Mallet Phase. 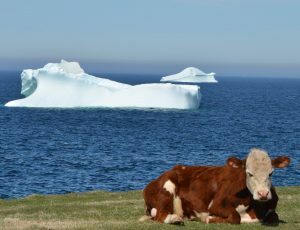 Cow practicing yoga in front of an iceberg in Newfoundland. Photo: Violet Lodge. In July, I traveled to chilly St. John’s, Newfoundland for a performance of Sextet at the biennial Sound Symposium in yet another Reich 80th birthday concert. One of the musicians in Sextet was the fabulous pianist Andrea Lodge. Her mother, Violet Lodge, gave me a photo of a cow and an iceberg that she took off the coast of Newfoundland. In my book I describe my yoga sessions with Steve Reich in the early days of rehearsals for Drumming. The photo reminds me of advice I was given by a yoga teacher: “Do yoga with the speed of an iceberg and the patience of a monk.” In the case of this photo it would be with the speed of an iceberg and the patience of a peaceful cow. 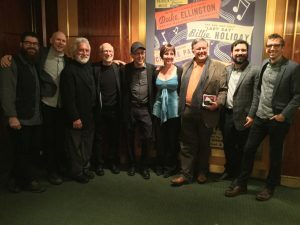 Carnegie Hall birthday celebration, Nov. 1, 2016 with (l. to r.) Josh Quillen, Jason Treuting, Garry Kvistad, Russell Hartenberger, Steve Reich, Micaela Haslam, Zoltán Rácz, Adam Sliwinski, and Eric Cha-Beach. Photo: Bonnie Sheckter. Reich preferred not to have any big parties until after his actual birthday, so the first official celebration of his 80th milestone was at Carnegie Hall after a concert that featured his Quartet for two vibraphones and two pianos, a premiere of his new work, Pulse performed by ICE and conducted by David Robertson, and the Reich/Korot video work Three Tales performed by ICE, Sō Percussion, and Synergy Vocals with Robertson again conducting. Following the performance there was a birthday party in the Rohatyn Room in Carnegie Hall with cake and an enthusiastic singing of Happy Birthday to Steve by musicians and friends. Alex Ross and Russell Hartenberger at Milton Court, Barbican Centre, Nov. 5, 2016. Photo: Bonnie Sheckter. Just a few days after the festivities at Carnegie Hall, Reich was honored in London’s Barbican Centre with a weekend full of concerts. Alex Ross, music reviewer for The New Yorker was on hand to speak about “The West Coast Roots of Minimalism.” His lecture was followed by performances of City Life and Drumming by students from the Guildhall. The Saturday evening marathon concert included Pendulum Music, Nagoya Guitars, Electric Counterpoint (played by Mark Stewart and twelve other guitarists including the New York quartet Dither), Different Trains, Pulse, and concluding with Three Tales performed by the Britten Sinfonia, conducted by Clark Rundell. Discussion at St. Luke’s church with (l. to r.) Vincent Corver, Chi-Yu Mo, Steve Reich, Russell Hartenberger, Sarah Mohr-Pietsch, at LSO Discovery Day, November 6, 2016. Photo: Bonnie Sheckter. 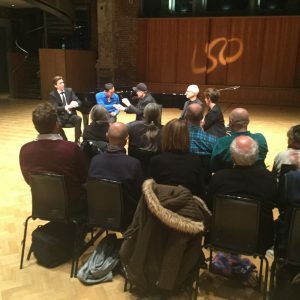 On Sunday afternoon at St. Luke’s Church near the Barbican, Steve Reich was the guest on an LSO Discovery day event that was moderated by Sarah Mohr-Pietsch, a presenter from BBC Three. The afternoon began with a performance of New York Counterpoint by Chi-Yu Mo and ended with Piano Counterpoint, an arrangement by Vincent Corver of Six Pianos for soloist and pre-recorded CD. In between was a wide-ranging discussion with the performers and Reich, and I was delighted to join them in the conversation. The evening concert featured the London Symphony Orchestra, conducted by Kristjan Järvi, and Synergy Vocals in Daniel Variations, You Are (Variations), and The Desert Music. Russell Hartenberger giving a lecture at PASIC in Indianapolis, IN, Nov. 11, 2016. Photo: Lauren Vogel Weiss. 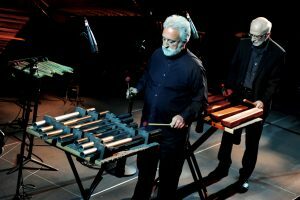 The Percussive Arts Society International Convention is a four-day event featuring concerts, workshops, master classes, and lectures. This year it was held in Indianapolis, Indiana from November 9-12. 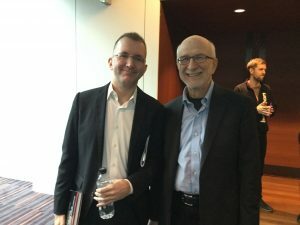 As a tribute to Steve Reich’s 80th birthday year I gave a talk titled Performance Practice in the Music of Steve Reich in which I presented highlights from my book. Russell Hartenberger at the University of Toronto performance of Birth of Time, Dec. 1, 2016. 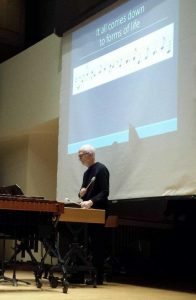 Steve Reich’s Drumming, Part I at the University of Toronto, Dec. 1, 2016. Nexus gave the premiere of the sixteen drum version of Drumming, Part I by Steve Reich at the symposium. The idea to use twice the number of bongos that is normally used for the piece occurred to Bob Becker and me when we conducted an experiment at the LiveLab at McMaster University in Hamilton, Ontario to determine what actually happens in a phase as opposed to what I think happens in a phase. Details of this recording session are in my chapter, “Anatomy of a Phase,” in Performance Practice in the Music of Steve Reich. Further results from the experiment and the latest research on the project can be found at www.maplelab.net/reich. Performance of Steve Reich’s Quartet at the University of Toronto with Gregory Oh and Midori Koga, pianos and Russell Hartenberger and Bob Becker, vibraphones, Dec. 2, 2016. Photo: Bonnie Sheckter. 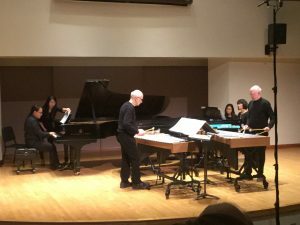 On the final concert of the symposium we gave the Canadian premiere of Steve Reich’s Quartet for two pianos and two vibraphones performed by Midori Koga and Gregory Oh on pianos and Bob Becker and me on vibraphones. Entrance to the Paul Sacher Stiftung, Basel Switzerland. Photo courtesy of Paul Sacher Stiftung. 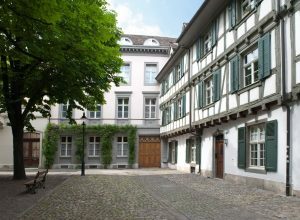 The year-long celebration concluded for me with a return trip to the Paul Sacher Stiftung (PSS) in Basel, Switzerland where, since 2008, Steve Reich has been depositing his sketchbooks, manuscripts, agendas, photographs, recordings, instruments, and correspondence. The Sacher archive is an international research center for the music of the twentieth and twenty-first centuries with over a hundred collections from leading composers and performers from Bartók and Stravinsky to Feldman and Reich. The director of PSS is Felix Meyer and the curator of the Steve Reich Collection is Matthias Kassel. Tina Kilvio Tüscher is archivist for Reich’s materials. All the folks at PSS have been extremely accommodating in providing me with access to Reich materials that were essential in writing Performance Practice in the Music of Steve Reich.